Ethereum is a blockchain framework that runs smart contracts using Solidity, an Ethereum-specific language. Homestead is the most recent release of Ethereum. For more information, see the Ethereum Homestead Documentation and the Solidity documentation. ecs—Specifies that Ethereum runs on an Amazon ECS cluster of Amazon EC2 instances. docker-local—Specifies that Ethereum runs on a single EC2 instance. With Amazon ECS, you create your Ethereum network on an ECS cluster composed of multiple EC2 instances, with an Application Load Balancer and related resources. 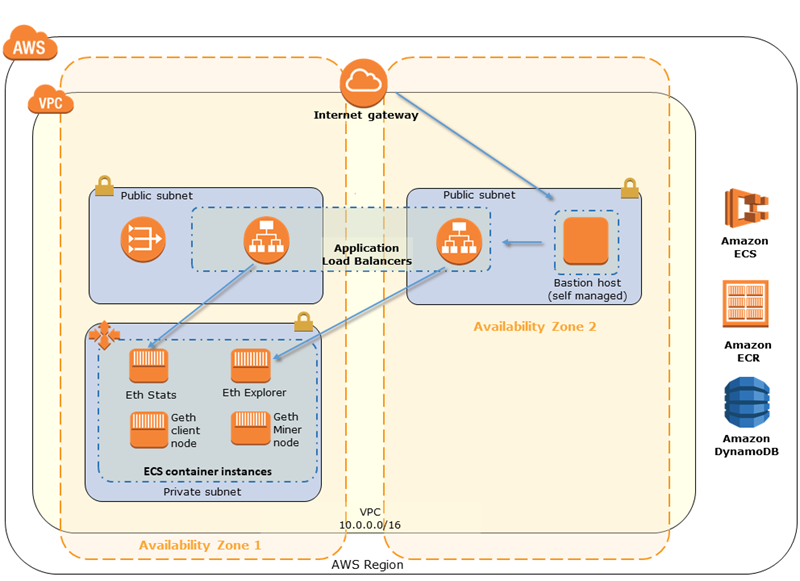 For more information about using the Amazon ECS configuration, see the Getting Started with AWS Blockchain Templates tutorial. Alternatively, you can launch Ethereum containers within a single Amazon EC2 instance. All containers run on a single EC2 instance. This is a simplified setup. Choosing an Ethereum Network ID value other than 1–4 creates private Ethereum nodes that run within a network that you define, using the private network parameters that you specify. When you choose an Ethereum Network ID from 1–4, the Ethereum nodes that you create are joined to the public Ethereum network. You can ignore private network settings and their defaults. If you choose to join Ethereum nodes to the public Ethereum network, ensure that the appropriate services in your network are internet-accessible. A mnemonic phrase is a random set of words that you can use to generate Ethereum wallets (that is, private/public key pairs) for associated accounts on any network. The mnemonic phrase can be used to access Ether for associated accounts. We created a default mnemonic associated with the default accounts that the Ethereum template uses. Use the default accounts and associated mnemonic phrase for testing purposes only. Do not send real Ether using the default set of accounts because anyone with access to the mnemonic phrase can access or steal Ether from the accounts. Instead, specify custom accounts for production purposes. The mnemonic phrase associated with the default account is outdoor father modify clever trophy abandon vital feel portion grit evolve twist. 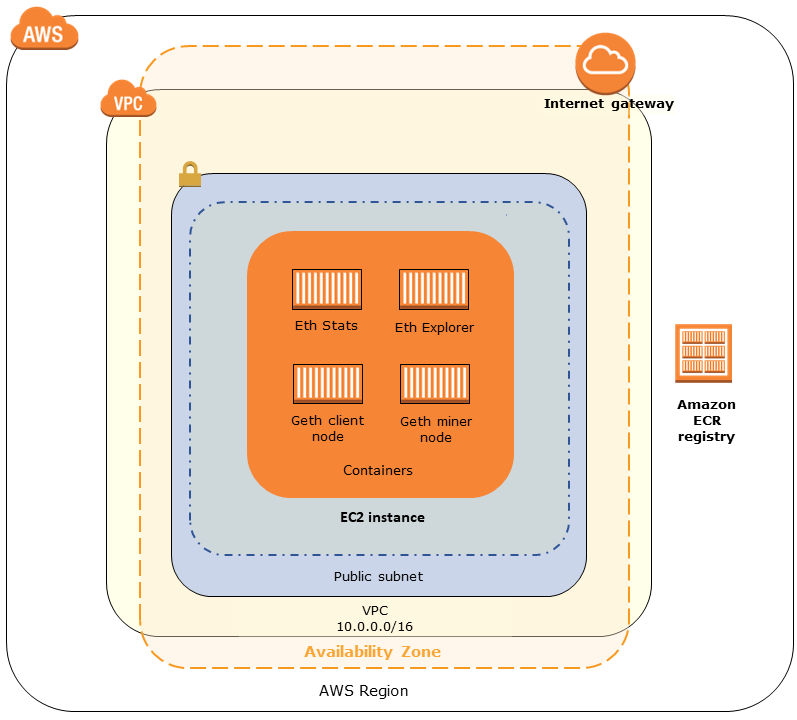 An Amazon EC2 key pair that you can use to access EC2 instances. The key must exist in the same Region as the ECS cluster and other resources. An internet-facing component, such as a bastion host or an internet-facing load balancer, with an internal address from which traffic is allowed into the Application Load Balancer. This is required with the ECS platform because the template creates an internal load balancer for security reasons. This is required with the docker-local platform when the EC2 instance is in a private subnet, which we recommend. For information about configuring a bastion host, see Create a Bastion Host. An IAM principal (user or group) that has permissions to work with all related services. An Amazon EC2 instance profile with appropriate permissions for EC2 instances to interact with other services. For more information, see To create an EC2 instance profile. An IAM role with permissions for Amazon ECS to interact with other services. For more information, see Creating the ECS Role and Permissions. Outbound rules that allow traffic to 0.0.0.0/0 (default). An inbound rule that allows all traffic from itself (the same security group). An inbound rule that allows all traffic from the security group for the Application Load Balancer. Inbound rules that allow HTTP (port 80), EthStats (served on port 8080), JSON RPC over HTTP (port 8545), and SSH (port 22) from trusted external sources, such as your client computer's IP CIDR. An inbound rule that allows all traffic from the security group for EC2 instances. Outbound rules that allow all traffic only to the security group for EC2 instances. For more information, see Create Security Groups. If associating this same security group with a bastion host, an inbound rule that allows SSH (port 22) traffic from trusted sources. If the bastion host or other internet-facing component is in a different security group, an inbound rule that allows traffic from that component. An Elastic IP address, which is used for accessing Ethereum services. A subnet to run EC2 instances. We strongly recommend a private subnet. Two publicly accessible subnets. Each subnet must be in different Availability Zones from each other, with one in the same Availability Zone as the subnet for EC2 instances. You specify an EC2 instance profile ARN as one of the parameters when you use the template. If you use the ECS container platform, you also specify an ECS role ARN. The permissions policies attached to these roles allow the AWS resources and instances in your cluster to interact with other AWS resources. For more information, see IAM Roles in the IAM User Guide. Use the policy statements and procedures below as a starting point for creating permissions. The following permissions policy demonstrates allowed actions for the EC2 instance profile when you choose the ECS container platform. The same policy statements can be used in a docker-local container platform, with ecs context keys removed to limit access. For the permissions attached to the ECS role, we recommend that you start with the AmazonEC2ContainerServiceRole permissions policy. Use the following procedure to create a role and attach this permissions policy. Use the IAM console to view the most up-to-date permissions in this policy. 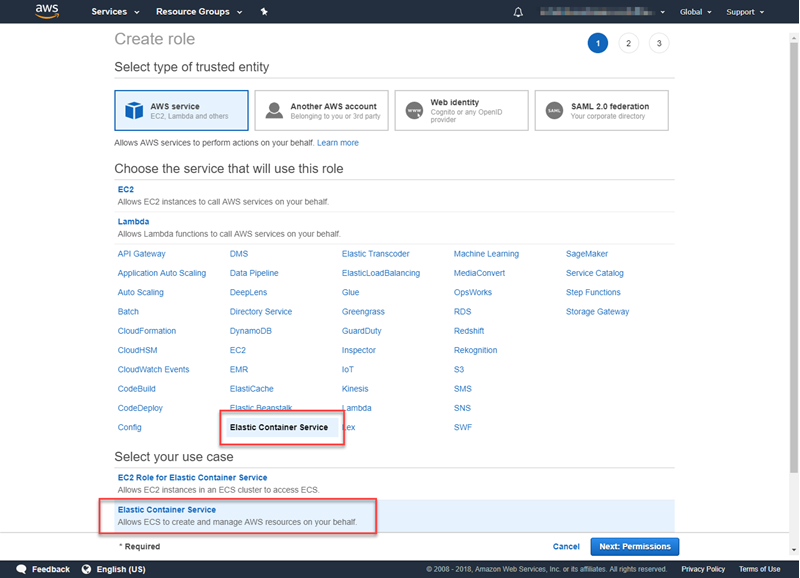 For Choose the service that will use this role, choose Elastic Container Service. Under Select your use case, choose Elastic Container Service, Next:Permissions. For Permissions policy, leave the default policy (AmazonEC2ContainerServiceRole) selected, and choose Next:Review. For Role name, enter a value that helps you identify the role, such as ECSRoleForEthereum. For Role Description, enter a brief summary. Note the role name for later. Select the role that you just created from the list. If your account has many roles, you can search for the role name. Copy the Role ARN value and save it so that you can copy it again. You need this ARN when you create the Ethereum network. ECS—The Output tab of the root stack provides links to services running on the Application Load Balancer. These URLs are not directly accessible for security reasons. To connect, you can set up and use a bastion host to proxy connections to them. For more information, see Proxy Connections Using a Bastion Host below. docker-local—You connect using the IP address of the EC2 instance hosting Ethereum services as listed below. Use the EC2 console to find the ec2-IP-address of the instance that the template created. If you specified a public subnet for Ethereum Network Subnet ID (List of VPC Subnets to use within the template), you can connect directly. Your client must be a trusted source of inbound traffic for SSH (port 22), as well as the ports listed. This is determined by the EC2 Security Group that you specified using the AWS Blockchain Template for Ethereum. If you specified a private subnet, you can set up and use a bastion host to proxy connections to these addresses. For more information, see Proxy Connections Using a Bastion Host below. With some configurations, Ethereum services may not be publicly available. In those cases, you can connect to Ethereum resources through a bastion host. For more information about bastion hosts, see Linux Bastion Host Architecture in the Linux Bastion Host Quick Start Guide. The EC2 instance for the bastion host is within a public subnet with Auto-assign Public IP enabled and that has an internet gateway. The bastion host has the key pair that allows ssh connections. The bastion host is associated with a security group that allows inbound SSH traffic from the clients that connect. The security group assigned to the Ethereum hosts (for example, the Application Load Balancer if ECS is the container platform, or the host EC2 instance if docker-local is the container platform) allows inbound traffic on all ports from sources within the VPC. With a bastion host set up, ensure that the clients that connect use the bastion host as a proxy. The following example demonstrates setting up a proxy connection using Mac OS. Replace BastionIP with the IP address of the bastion host EC2 instance and MySshKey.pem with the key pair file that you copied to the bastion host. This sets up port forwarding for port 9001 on the local machine to the bastion host. Next, configure your browser or system to use SOCKS proxy for localhost:9001. For example, using Mac OS, select System Preferences, Network, Advanced, select SOCKS proxy, and type localhost:9001. Using FoxyProxy Standard with Chrome, select More Tools, Extensions. Under FoxyProxy Standard, select Details, Extension options, Add New Proxy. Select Manual Proxy Configuration. For Host or IP Address type localhost and for Port type 9001. Select SOCKS proxy?, Save. You should now be able to connect to the Ethereum host addresses listed in the template output.